LINCOLN, Neb. 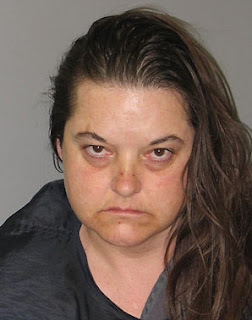 (AP) -- The mother of New York Yankees pitcher Joba Chamberlain is jailed in Nebraska and facing a felony charge after being arrested on suspicion of selling methamphetamine to an undercover police officer in February. She was charged Monday with delivery of an exceptionally hazardous drug. Her bail was set at $5,000, and she was assigned a public defender, whose name was not on her jail record. Chamberlain found out about the arrest after arriving at Yankee Stadium on Monday night. He said he hadn't spoken with her in a while. "You've only got one mom, man, and you've got to be thankful for her," he said. "I still love her." Jacqueline Standley's arrest was delayed until laboratory tests done on the substance purchased from her confirmed it was meth. I mean this lady looks like she is really on the up and up. I highly doubt that she would sell a gram of meth to an undercover cop. At least they waited to test the substance before arresting her. HA! On a side note don't you think Joba may want to call his mother and help her out? I wouldn't want to trust a public defender in Nebraska with walking my dogs, let alone defending my mother in a possession of meth charge...I'm just saying.